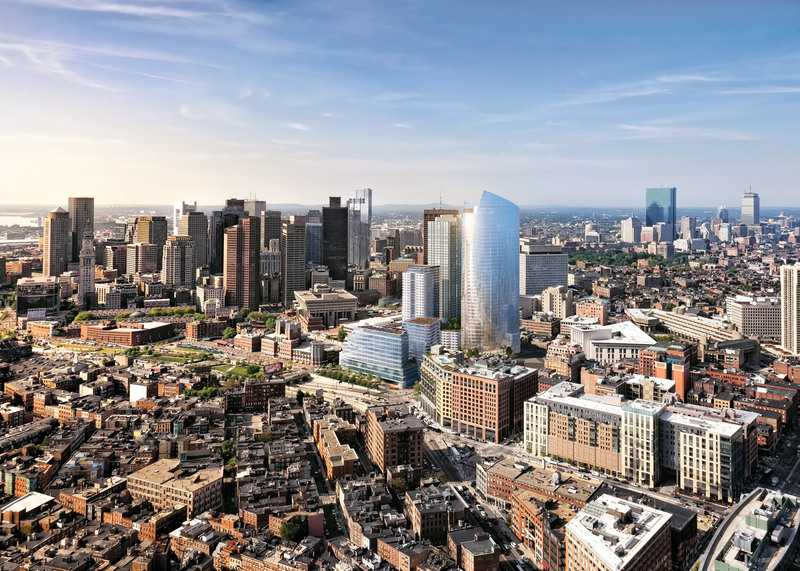 The new Bulfinch Crossing development will see 812 residential units, 1.2 million square feet of offices, a 192-key hotel, and 83,000 square feet of street-level retail and restaurant space added to the area; 1,150 parking spaces will also be available. 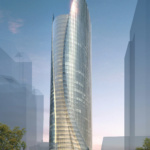 The mixed-use development will be the first to include significant housing in the urban renewal district and demonstrates a refresh of downtown typologies by creating slender towers with a reduced footprint. 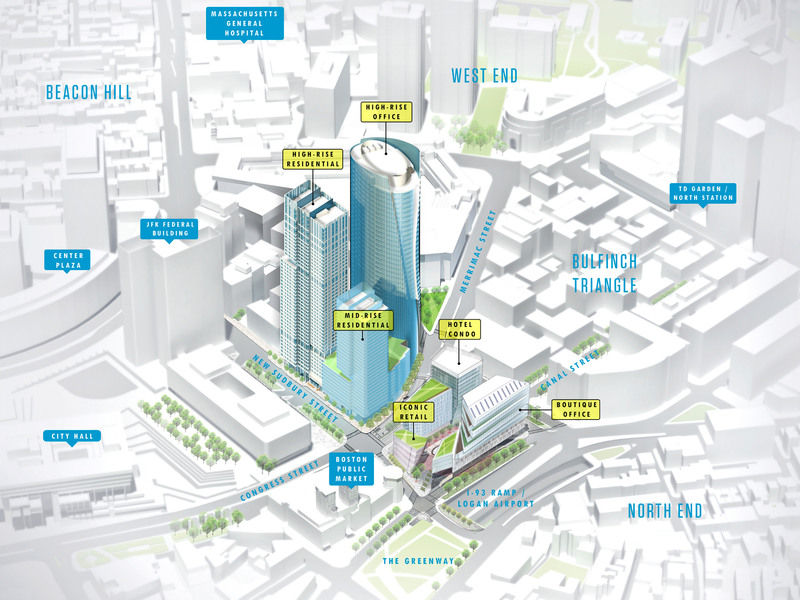 At the crossover where six neighborhoods come together in Boston is… a parking garage. 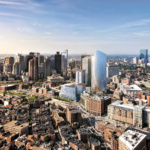 Boasting 2,300 spaces spread among nine stories, the concrete monolith, officially referred to as the “Government Center Garage,” is a byproduct of 1960s planning and rests on a 4.8-acre site known as Bulfinch Triangle. Vehicular dreams, however, have never quite been realized. The garage has only reached capacity twice: Once for a Rolling Stones gig and another time during a major snowstorm in 1978. 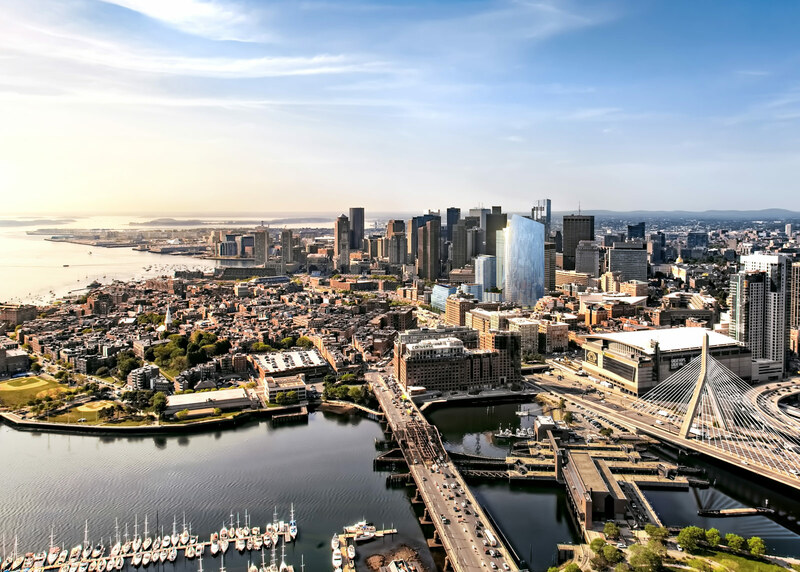 “This part of the city is not as dependent on automobiles as everybody imagined it would be,” said Kishore Varanasi, principal and director of urban design at Boston-based CBT Architects. The firm is working with the HYM Investment Group to redevelop the area. Fellow CBT principal David Nagahiro added that today approximately 1,200 cars use the garage on a daily basis. 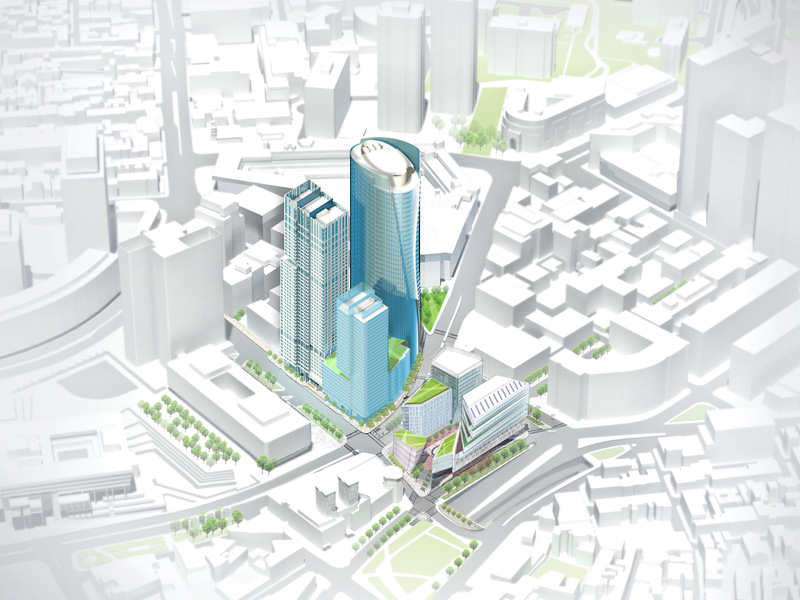 Echoing their 1960s predecessors, CBT and HYM have big, transit-oriented plans for the site. 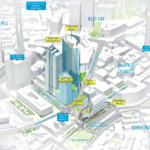 De-emphasizing the automobile, the $2 billion “Bulfinch Crossing” master plan involves the creation of a new public square and pedestrian promenade linking Rose Fitzgerald Kennedy Greenway and the Market District along Congress Street through to Canal Street. 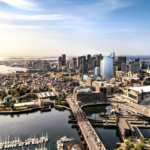 Space to store 850 bicycles (a city requirement) will be included as will a Hubway station for Boston’s bike-sharing program and direct connections to Zipcar, the MBTA bus service, the Green and Orange subway lines, and the North Station commuter rail service. 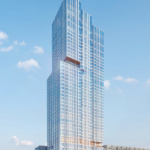 CBT’s $2 billion master plan was approved in 2013, and a year ago the city gave the green light to two of the tallest structures in the development: New Haven firm Pelli Clarke Pelli’s One Congress office tower at 528 feet and a 480-foot residential tower from CBT Architects. All in all, Bulfinch Crossing will see 812 residential units, 1.2 million square feet of offices, a 200-key hotel, and 85,000 square feet of street-level retail and restaurant space added to the area; 1,150 parking spaces will also be available. 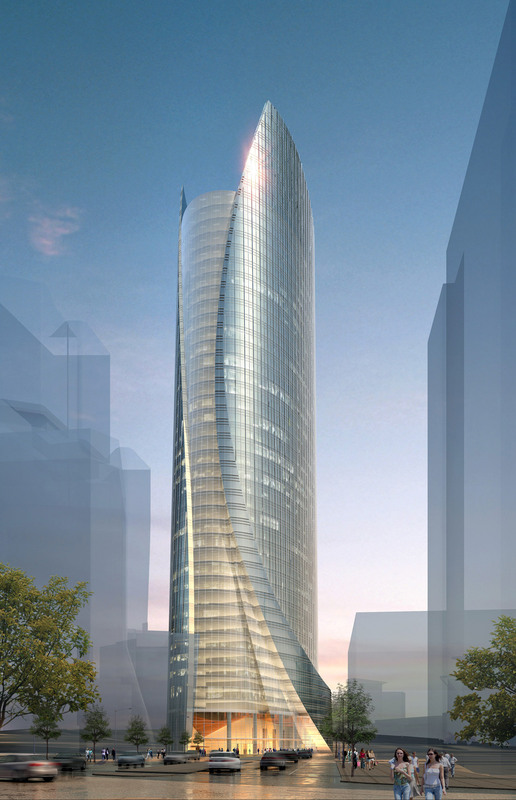 The mixed-use development will be the first to include significant housing in the urban renewal district and demonstrates a refresh of downtown typologies by creating slender towers with a reduced footprint. “Much of the design challenge has been to design the space so that it has eight different desire lines—both visual and physical—that run through the site,” said Varanasi. 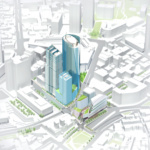 In plan, Bulfinch Crossing doesn’t look like a typical plot of grid-divided land primed for development. Instead, a variety of shapes work to facilitate these desire lines and natural circulation through the site. The scheme will be completed in phases. “Nobody needed convincing that this garage has to go away,” said Nagahiro, who added that despite this sentiment, the garage couldn’t simply be knocked down. Even though the facility is only at half-capacity, its daily use is a valuable source of income to the city and, as a result, will be taken down incrementally to sustain city revenue. However, the garage will remain open for business throughout the redevelopment. 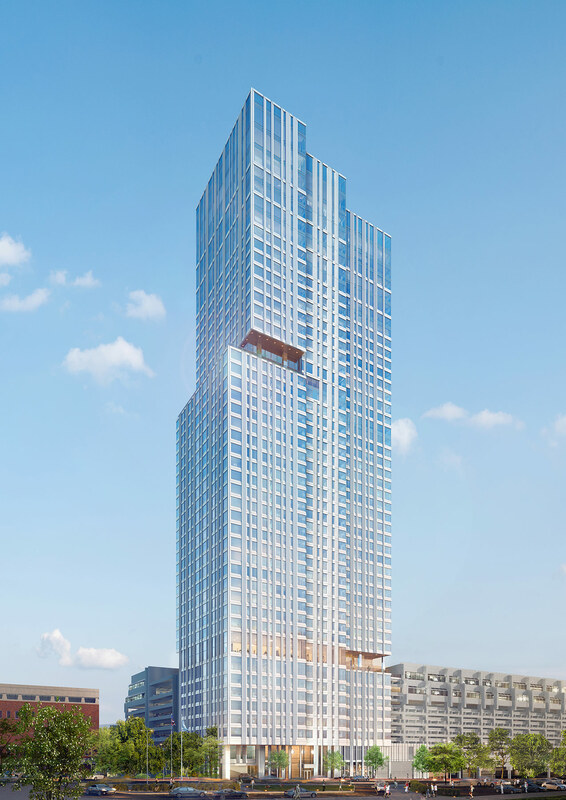 slated to begin as early as 2018 and the site pad for CBT’s 480-foot residential tower is currently under construction and is scheduled for completion in summer 2020. Further construction deadlines are yet to be finalized because they are predominantly market-driven, however, Varanasi speculated that the garage should be in its final stage by 2023.